The PRIAN presidential candidate, Álvaro Noboa, gave a live interview through Contacto Directo, the morning news show that is brodcasted by the TV channel Ecuavisa. 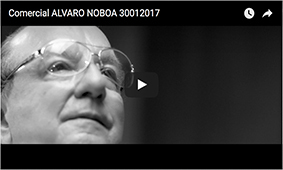 Álvaro Noboa mantained an extensive dialogue about the political party, his family relations, and the political persecution he is suffering. He also confirmed, according to the surveys, that Rafael Correa and Álvaro Noboa are the main presidential candidates for the 2013 elections. ALFREDO PINOARGOTE: After Assembly Member Vicente Taiano’s disaffiliation from the PRIAN, Assembly Member Tito Nilton Mendoza’s has as well, and Fernando Flores has announced that, like Vicente Taiano, he will also join Sociedad Patriótica, because they believe that there should be only one candidate challenging President Correa. Furthermore, this Monday, El Universo, published a photo of Luis Noboa Icaza, also a PRIAN Assembly Member, together with Gilmar Gutiérrez, Luis Almeida and Vicente Taiano forming the three of the Sociedad Patriótica list. Our guest is Attorney Álvaro Noboa, PRIAN presidential candidate. Counselor, good day, welcome to Contacto Directo. ÁLVARO NOBOA: Thank you very much, Dr. Pinoargote. ALFREDO PINOARGOTE: How would you define the attitudes of those people so close to you, who have been faithful and have been together with you? ÁLVARO NOBOA: Yes, first of all, it’s necessary to clear up a series of points so that nothing remains in the air, like that there have been this number of disaffiliations. Before that, I want to say to the country that we are the only ones who invest a great deal of money in carrying out polls every 15 days, which responses from the most important points throughout the country. Those polls show that Correa is at 36%, Noboa 21%, Lasso 3%, Lucio 2%, Acosta 2% and then those who don’t know and don’t answer, and yes that’s very typical. ALFREDO PINOARGOTE: Fine, but Correa’s people say that he has 60% and you have 1% and Lasso’s people say that Correa has 30% and you have 20% and meanwhile Lucio’s people say that…. or, that is to say, each one has their own crystal ball. ÁLVARO NOBOA: And those who don’t know and don’t respond, the 36%, our crystal ball has been pretty accurate since ’98. When Correa, in 2006, said that he was going to beat me in the first round, in only one round, I won the elections, and so, I’ve got to believe in my crystal ball in this situation. There is no reason anywhere why a PRIAN representative should go over to Sociedad Patriótica, let’s look at this case by case. Vicente Taiano was a Vice-Presidential candidate in the year 2006, when I beat Correa. Where in the history of Ecuador have you ever seen a Vice-Presidential candidate of one party move to another party? Vicente Taiano visited me a couple of months ago; he’s a timid, cowardly man. Not like his son; his son is brave. And he tells me that Correa is going to imprison him and all those working for Bananera Noboa. He is the President of Bananera Noboa, and therefore he was in a panic, and the person giving him that information, according to him, was Gutemberg Vera. Gutemberg Vera, as we know, is a lawyer for the government. So he went into a panic. To me, they used him to weaken the PRIAN and to destroy Sociedad Patriótica, and that, effectively, has happened. ALFREDO PINOARGOTE: He is a lawyer, and a good lawyer, and he’ll know if they’re real threats or not. ÁLVARO NOBOA: He’s a cowardly, timid man. He’s been like that his entire life and I have said it to him to his face. So it’s not, I tell you now, it’s not an ideological problem. Because if there is someone who has been ideologically identified with me, it’s him, who has even been a Vice-Presidential candidate, several times Assembly Member, etc. ALFREDO PINOARGOTE: Ah, the issue is that he’s been threatened and for that reason has taken that attitude. ÁLVARO NOBOA: It’s that he told me so in my own living room and you can put it to a lie detector test. He said so in my very own living room and he carries it over to his son. His son, yes, is a brave man, but he has to follow his father. Luis Noboa Icaza: here I have a taped cell phone message that he left me yesterday, or the day before, where he states that he has never joined the Sociedad Patriótica, that that was all nonsense, a rumor, and if you look at Twitter, he also states it publicly there. ALFREDO PINOARGOTE: Clearly. It seems to me that he appeared in a photo, together with Gilmar making a “3” together with Taiano. ÁLVARO NOBOA: Look, the Noboa Icazas. I’m a father figure to them, they are like my own sons. ALFREDO PINOARGOTE: Clearly. He is even a Noboa Corporation stockholder, as well. Executive Director of the corporation. He’s your nephew. One could say, there is a relation. ÁLVARO NOBOA: Of course, I became so, because as well all know, Ecuador knows, that his father didn’t play the role that he should have done. And so I became the paternal figure for them and therefore I don’t believe in his entire life, Lucho would do something like that. It was a charade. He was invited that day to where Vicente Taiano was and they took a photo of him, and he didn’t send that photo, apparently Vicente Taiano did and it’s just another charade. ALFREDO PINOARGOTE: But he stated later that since he’s the president of Barcelona, he has decided not to participate in politics; he’s not gone to Sociedad Patriótica. ÁLVARO NOBOA: No, Lucho had a conversation with me. They talk things over with me just like when you want to talk to your children. When they want to be this thing or the other, they come and talk to me. He said to me, look, Uncle, I am a resident of the United States, and the United States residency, that residency is in conflict with my being a member of the Assembly, because the US authorities are asking how would I be a resident there if I am spending all my time in Ecuador, or in Quito. So we came to the agreement that what he could do, in accordance with the Constitution of the United States, and with the Constitution of Ecuador is to run as an Assembly Member for New York, as an immigrant. In other words, as an immigrant or Ecuadorian resident in the United States. ALFREDO PINOARGOTE: But has that been resolved already? ÁLVARO NOBOA: I accepted it. ALFREDO PINOARGOTE: Now, but to get to bottom of his position: someone published the photo. What Taiano says, and here on has to support one candidate, Mr. Lucio Gutiérrez says that he is ready to withdraw his candidacy – or that is to say, it’s not convenient in the sense if you basically have the same proposals – that there should be only one candidate. ÁLVARO NOBOA: But I just want to make one thing clear, that Lucho’s intention, and he’s like a son to me, hasn’t at any moment been to join the Sociedad Patriótica, nor to leave the PRIAN. ALFREDO PINOARGOTE: Now to his position. I believe that on August 20, he visited the Carondelet with Barcelona. They were there for the changing of the guard. They had lunch with the President and Barcelona are going to be champions two months before the elections and now he decides that because of his situation as president of Barcelona he is going to abstain from all political situations with Sociedad Patriótica and with the PRIAN. ÁLVARO NOBOA: That’s not what he said to me. I have to respond to what is told to me, just like you said, like you asked me about the polls, and that is what he said to me. Him and Toño, Antonio Noboa, his brother, didn’t consult with me. I was out of the country. They didn’t consult with me about the visit to Economist Correa, and my advice would have been not to go because Correa kicked Toño out of the Congress. He chased him out of office in the year 2006, so how could you possibly go and visit your own hangman and shake hands with him, go to lunch with him, etc? So Toño is forgiven because you always forgive your children and they are like my children. Toño did wrong in going to visit Correa and Lucho did wrong in going with him. That’s something I let them know very clearly. I say it again. Look at those videos – you, here, have a splendid archive – they chase him out and chase out the Assembly Members. ALFREDO PINOARGOTE: You had an Assembly Member, and Gloria Gallardo and all that. ÁLVARO NOBOA: But they can’t go visiting their hangman. He can’t go visiting his own hangman, that shouldn’t happen. ALFREDO PINOARGOTE: Okay, in regards to that your position is clear. In regards to the candidacies, apparently your candidacy is not at risk. That crystal ball even works on Saturdays and according to that crystal ball it even knows who the candidates are. Let’s see what it said on one of those Saturdays with respect to the candidates. SATURDAY CHAIN 25 August 2012 RAFAEL CORREA: Yes, I am candidate, and will ratify my responsible decision before history to take maximum advantage of the immense mining potential of Ecuador. This is one of the fundamental issues because there has been a lot of hypocrisy: no to mining. Future candidates Guillermo Lasso, Lucio Gutiérrez, Álvaro Noboa should state clearly if they are going to say no to mining. ALFREDO PINOARGOTE: Now, how does this appear to you? He names the three right-wing candidates – Álvaro Noboa, Guillermo Lasso and Lucio Gutiérrez – but he puts infantile left-wing arguments in the mouths of those candidates. ÁLVARO NOBOA: Of course. What is clear is that he admits who are the future candidates. ALFREDO PINOARGOTE: But he admits that what is most convenient to him is that there are three candidates instead of just one. Perhaps you see it from a different side? ÁLVARO NOBOA: I’m going to talk about that in a moment. We had a conversation between us regarding to that issue. I did another poll regarding that issue in order to see how well I would do in an alliance with Lucio, and I got less votes with Lucio than without him. So, because Lucio has been the aspiration of the garbage of Ecuador, he has pulled in treacherous Assembly Members like Vicente Taiano – in the case of Tito Nilton, I will explain once more that he say day before yesterday that he is not going to join Sociedad Patriótica, and not just that, at the moment his son directs the young people in Manabí for the PRIAN. I spoke to the son yesterday in order to be sure, and he said, I am not in agreement with all those rumors going around. I continue working so that, in Manabí, you will be our next President. Flores, they’ve spent already four years saying to Flores and to poor Lenin Chica that they’re going to sway them. They’ve been the most solid members of the PRIAN and, regrettably, have had that rumor swirling round them for four years. ALFREDO PINOARGOTE: In any case, you are not prepared to review your candidacy, according to the polls that you have. ÁLVARO NOBOA: According to the polls that I have, it doesn’t make sense, it’s not the right thing for me. ALFREDO PINOARGOTE: But it appears to be the right thing for Correa to have three candidates. ÁLVARO NOBOA: It’s not the right thing for me because the same thing that happened to Cynthia Viteri is going to happen to Lasso. You are a brilliant journalist, you are my friend, and a brilliant political analyst. I ran in 2006, and Cynthia Viteri ran, and seeing that I led very strongly, the Socialcritianos dropped Cynthia Viteri and voted for me. The same thing is going to happen with Lasso’s people. ALFREDO PINOARGOTE: Or the reverse could happen, let’s say. The issue is that, as the campaign advances, the one who is getting ahead is going to take the votes. ÁLVARO NOBOA: That’s right. Lasso, for his own reasons, has invested ten times more than what I have in promotion. Ten times more! Imagine that. You, who knows our economic capacity. I will make that investment in the months that really count, which is the last month, Alfredo. ALFREDO PINOARGOTE: But, according to the law, there is a maximum limit. In those cases, in those months, it’s that there’s no restriction because all the politicians are campaigning. ÁLVARO NOBOA: That’s why Lasso is campaigning now and the President, too. Well, Economist Rafael Correa, with all the respect he deserves, what he’s doing is against the law, against the law in everything, not just that. He is openly dedicated to persecuting me to see whether I will not become a candidate, and here in Ecuador Inmediato, there is a announcement and I would also like to demonstrate to Ecuador once more how they are trying to extract $49 million dollars from Bananera Noboa, while only $700,000 from Dole, $39,9500 from Chiquita, $14,000 from Reybanpac, and $11,000 from Del Monte. ALFREDO PINOARGOTE: But that’s what they want to collect. For the moment, let’s say, you have successfully defended yourself, you can even earn protection, based on the law, in an counter suit. ÁLVARO NOBOA: That success I place squarely on Attorney Sylka Sánchez who has been the Director of our Legal Department for over 15 years. ALFREDO PINOARGOTE: But this has already occurred in previous elections, because already in 2009, when there were elections in 2009, this demand already existed, and the IRS had wanted to collect. ÁLVARO NOBOA: And he’s not going to be able to collect. First, because there is no money in Bananera Noboa to pay that kind of amount. Bananera Noboa represents a capital of $5 million dollars, it’s been inactive for more than three or four years, and in the moment where, breaking the law, they try to make good on that demand, they will take away Bananera Noboa’s patrimony and it will end up owing $95 million. ALFREDO PINOARGOTE: It projects an image that you are being persecuted. It’s a form of legitimizing Álvaro Noboa’s candidacy and they say, they’re persecuting me and they say a government which is all-powerful is persecuting me, and yet, they can’t collect the debt from you. ÁLVARO NOBOA: That’s it. Fine, I have very good lawyers. Sylka is a spectacular lawyer. Dr. Fernando Alarcón is a spectacular lawyer. And we use one of the best people in Ecuador to review our responses. But what happens is a campaign of terror very similar to that of El Universo, and I want you, who is a person with a perfect archive—The judge who found for El Universo, the judge has been disrobed; the judge who found for Correa, is a judge who is rewarded. They’ve taken it to where the judge who grants the right to support is suspended for 90 days. They take out a penal case against him, and they threaten him with being disrobed and imprisoned. That’s what Correa calls justice in Ecuador. And not just that, but Economist Carlos Marx Carrasco, they almost call him Rafael Carlos Marx Carrasco, who is 4th rank: President, 1st line; Vicepresident, 2nd line; Ministers, Subsecretaries, 5th line, he’s a 5th line little man. ALFREDO PINOARGOTE: But he’s an important functionary. He’s the Czar of the Internal Revenue. ÁLVARO NOBOA: The Czar is called Rafael Correa. He’s the minor assistant to the Czar. He says, in his own words in Ecuador Inmediato, the Director of the Internal Revenue Service, Carlos Marx Carrasco, he states that he had solicited the suspension of Fourth Guayas Judge, Augusto Posligua from the Judicial Council, who accepted the petition of a cautionary measure for payment of the tax debt. The very next thing was that the magistrate was suspended for 90 days. They all control the Court. ALFREDO PINOARGOTE: With all these antecedents, you’re not going to withdraw your candidacy? ÁLVARO NOBOA: I’m not going to withdraw my candidacy. I am going to easily beat Correa. I am in second place, why should I withdraw if according to my polls Álvaro Noboa is in second, Guillermo Lasso, 2 and Lucio 2. There are only two candidates: Correa and Álvaro Noboa, and the two of us are putting everything on the line. ALFREDO PINOARGOTE: Counselor Noboa, thank you for your participation in Contacto Directo.